One of the cool features in iOS 4 for the iPhone 3GS and iPhone 4 is the ability to finally be able to customize your home screen and lock screen photos. 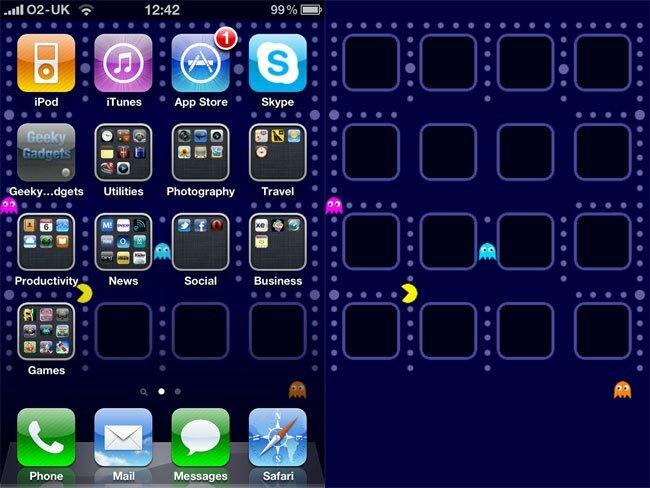 This has led to lots of cool custom images being released on the web, although we think this is probably the coolest one we have seen so far, and will definitely appeal to all the video game fans out there, the Pac-Man iOS 4 wallpaper. As you can see from the photo, the Pac-Man iOS 4 wallpaper looks great on the iPhone, if you want it for your iPhone 4 or iPhone 3GS you can download it at the link below.